“Technology is just a tool. In terms of getting the kids working together and motivating them, the teacher is the most important.” – Bill Gates, American Entrepreneur and Founder of Microsoft Co.
At Kids Great Minds we know this to be true! With our proven expert teaching capabilities and state of the art software, we want to unleash your child’s creativity, intellect and love for the Digital world to make screen time a fun, interactive and productive learning experience even after the class is over! Click here to learn more about our unique educational program. Here is what our customers say about our educational format. Join us to and create your own video games. 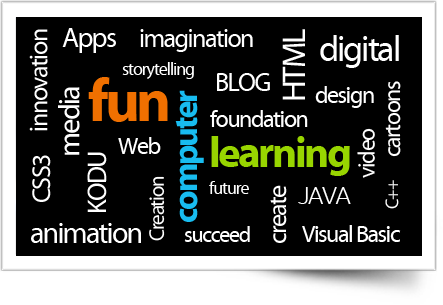 Our courses are oriented for students with no previous knowledge of programming, some programming and experts. We use new visual programming languages made specifically for video game creation. All games must follow our non-violence policy. On these courses we bring the best from the Carnegie Mellon University, Massachusetts Institute of Technology, ORACLE and Microsoft in terms of computer languages. We have courses for all levels of programming, from a beginner all the way to the expert that looks for perfection on his/her code. Our easy to follow classes provided by experts in the field, engage and motivate our students to create their best code. Our web and blog creation courses will show you how to design and develop beautiful websites from the ground up. We utilize the world standard in web development tools like WordPress, HTML and Java. With our easy to learn techniques, you will be able to build a simple, yet powerful and functional website in no time. And the best part is that you don’t have to be a computer wiz! "My daughter loves this program because it is very hands-on. Kids can certainly put their wide imagination into good use when they learn how to do computer animation!" Get a FREE 3D printed keychain with your child’s name by registering in one of our courses by Friday, January 9th 2015.